WeObserve – “An Ecosystem of Citizen Observatories for environmental monitoring” is a new Coordination and Support Action launched in December 2017. Funded by the EC H2020 program, its objective is to improve collaboration between existing Citizen Observatories, widely supported by the European Commission through the funding programs FP7 and H2020, and related regional, European and international activities. WeObserve tackles the following key challenges that COs are currently facing: awareness, acceptability, and sustainability, aiming to create a sustainable and vibrant ecosystem of COs to advance citizen science to the mainstream of environmental monitoring. The WeObserve project will run for three years and brings together a strong consortium of 7 partners, built upon the four H2020 CO projects, namely Ground Truth 2.0, GROW, LandSense and Scent, with strong links to a wide range of networks (i.e. ECSA), users and stakeholders, such as GEO and Copernicus (CREAF), which have active roles within the project. The project also has strong ties to the previously funded FP7 COs through the members of its Expert Advisory Board. WeObserve specifically aims to develop five Communities of Practice to assess the current CO knowledge base and strengthen it to address future environmental challenges using CO-driven science. The WeObserve consortium will also extend the geographical coverage of the CO knowledge base to new communities and support the implementation of best practices and standards across multiple sectors. Moreover, WeObserve will reinforce links of ongoing COs with regional and global initiatives, including GEOSS, Copernicus and the UN Sustainable Development Goals (SDGs) and promote the uptake of information from CO-powered activities across various sectors and foster new opportunities and innovation in the sector of in-situ earth observation. 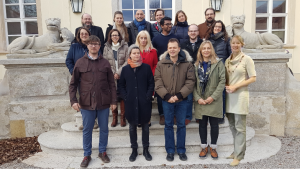 The WeObserve consortium met on 12-13 December 2017, at the premises of project coordinator IIASA in Laxenburg, Austria, to secure the partners’ consensus on the vision, mission and operational plan for WeObserve, as well as defining the roles, expectations, and the project timeline. Ground Truth 2.0 will actively contribute and benefit from the co-creation, strengthening and uptake of the CO knowledge base and in the integration into Earth Observation initiatives. For more information on WeObserve, you can visit the project website: https://www.weobserve.eu/.